Some projects don't need to be extravagant to be fulfilling. Building a decent fleet of cars for Harlem Station is one of them. 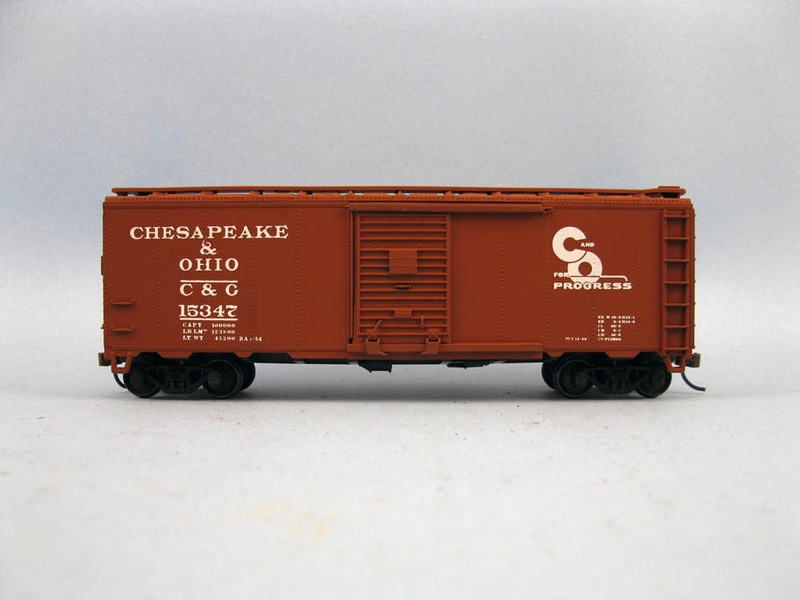 The ubiquitous Athearn 40ft boxcar is among the most common model you can find. Most people have a lots of them, often laid aside as they are replaced by better looking models. In my case, many of them sports paint schemes that won't probably be ever required by any layout Icould wish to build. On the other hand, I recently purchase a lot of CDS Lettering dry transfer sets at discount price. 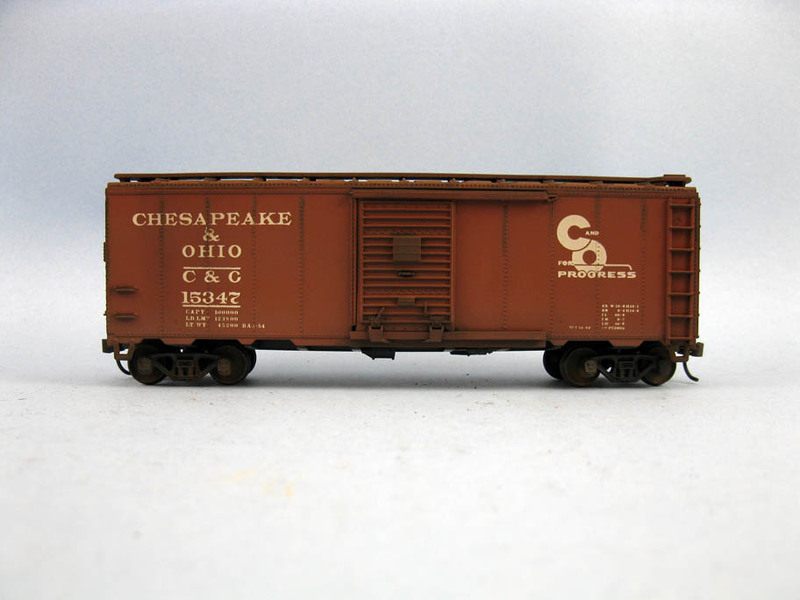 Among them was a Cheasapeake & Ohio 1954 boxcar set which was an almost perfect match for a car I once spotted on Harlem Station pictures. It didn't take me long to strip the paint with Super Clean and proceed to paint it with Krylon Red oxyde primer. This paint is perfect for a wide array of cars. The flat finish has enough tooth to apply directly dry transfer lettering and it is also extremely easy to weather. In fact, while this primer can look very red for certain prototypes, be aware you can darken easily by airbrushing a mix of India ink and 70% isopropyl alcohol. When weathered with powders, but also with artist oil washes, very deep gradient of color can be achieved. 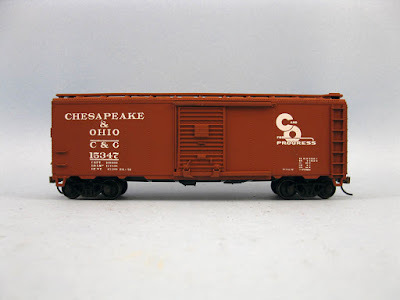 In fact, reproducing the same effect with regular hobby boxcar red doesn't yield exceptionally better results. Applying dry transfer lettering isn't my cup of tea. 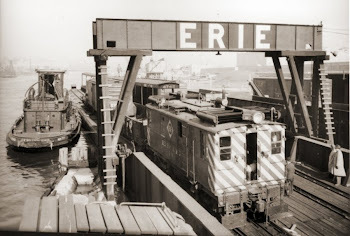 In the past, I used pencil to rub the letters on with mixed results. Also, placing the artwork on the model can be tricky. However, dry transfer doesn't leave ghost film lines and doesn't require to wait for decals and chemicals to cure. That said, the crispness of the artwork isn't always stellar. For this particular project, I decided to do things differently and searched my art supplies from college days to find something suitable to burnish the lettering. I came upon an old paper blending stump used for creating fading effect when drawing. The stump is sturdy enough to sustain the effort required, but it's relative softness makes it perfect to apply a good deal of force on the transfer film without distorting it. I didn't experience lettering cracking badly and the relative large surface made the process quick and efficient. I never tried metal ball burnishers, but definitely, the paper stump does an excellent job and conform itself very well over seams, raised details and rivets. For the rest, I dullcoted the model, faded the paint with a tan wash, airbrushed the model with some light passes of India ink and alcohol and finally touched up the roof, placards, hardware and rivets with weathering powders. I didn't try to make the model a rust bucket since it would be about 2-3 years old on my layout. In less than 30 minutes, a very generic and crude model became an excellent approximation of the real thing. 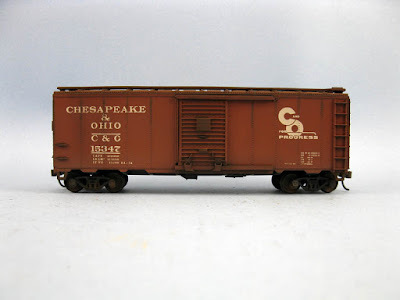 Once again, I remind you a realistic weathering job done with some restrain is the most important feature required to make a car prototypical looking. Our brain will recognize colors and textures before the small details. If you can afford better models, then it's even better! Also, weathering cheap cars is less intimidating than doing it with a $50 car! My first "fading" wash is used to reproduce the UV rays effect on paint. I airbrush a mix of tan acrylic paint diluted with the ubiquitous India ink + 70% alcohol. Later, I airbrush the india ink + alcohol mix over the roof and ends to darken them more than the side as often seen on prototype. 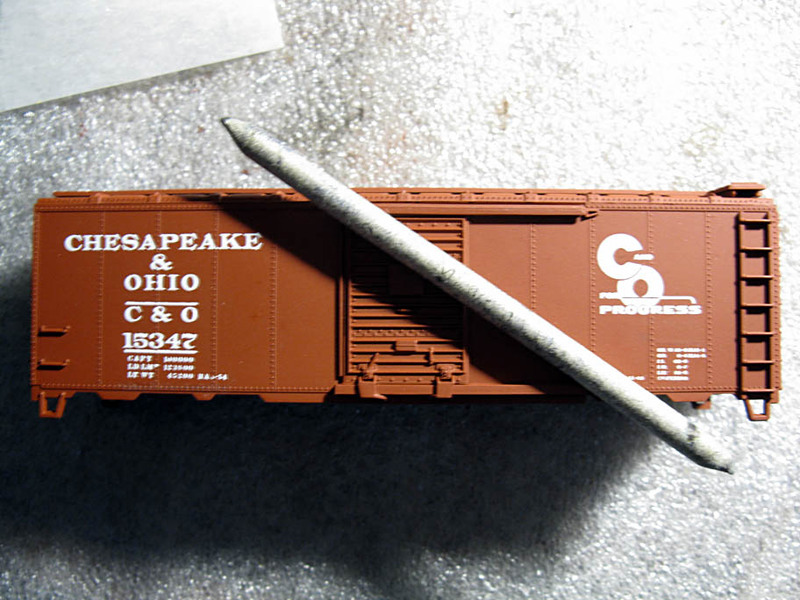 From there, custom weathering can starting depending the effects desired. To be noted, I don't always use the same tan color. Sometimes, it's more pale, something it's ochre. It will often depends if it's a south western car or an eastern one: they don't weather identically due to climate.